Magma Red Metallic exterior and Medium Earth Gray interior, XLT trim. EPA 23 MPG Hwy/17 MPG City! Aluminum Wheels, Trailer Hitch, Turbo Charged, Back-Up Camera, 4x4, TRANSMISSION: ELECTRONIC 10-SPEED AUT... SYNC 3. CLICK NOW! KEY FEATURES INCLUDE 4x4, Back-Up Camera, Aluminum Wheels. Keyless Entry, Child Safety Locks, Electronic Stability Control, Brake Assist, 4-Wheel ABS. 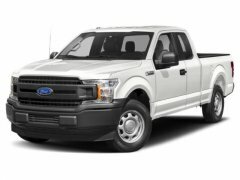 OPTION PACKAGES EQUIPMENT GROUP 301A MID 4.2" Productivity Screen in Instrument Cluster, Class IV Trailer Hitch Receiver, towing capability up to 5,000 lbs, on 3.3L V6 PFDI engine (99B) and 2.7L EcoBoost engine (99P) or up to 7,000 lbs, on 3.5L EcoBoost engine (99G) and 5.0L V8 engine (995), smart trailer tow connector and 4-pin/7-pin wiring harness, Rear Window Defroster, Rear Under-Seat Storage, Fixed Backlight w/Privacy Glass, 8-Way Power Driver Seat, Radio: Single-CD/SiriusXM w/7 Speakers, 7 speakers and a 6-month prepaid subscription, Service is not available in Alaska and Hawaii, Subscriptions to all SiriusXM services are sold by SiriusXM after trial period, If you decide to continue service after your trial, the subscription plan you choose will automatically renew thereafter and you will be, TRAILER TOW PACKAGE Towing capability up to 11,100 lbs, Class IV Trailer Hitch Receiver, towing capability up to 5,000 lbs, on 3.3L V6 PFDI engine (99B) and 2.7L EcoBoost engine (99P) or up to 7,000 lbs, on 3.5L EcoBoost engine (99G) and 5.0L V8 engine (995), smart trailer tow connector and 4-pin/7-pin wiring harness, Higher-Capacity Radiator, Pro Trailer Backup Assist, Higher-Power Cooling Fans, Upgraded Front Stabilizer Bar, ENGINE: 3.5L V6 ECOBOOST auto start-stop technology WHY BUY FROM US Spring Clearance Sale On Now! Call Or Click Today! New-Advertised sale prices are after all factory rebates including retail customer cash, special customer cash, bonus cash, ford credit cash, trade assistance cash, and other bonus cash. Customer may qualify for additional incentives.